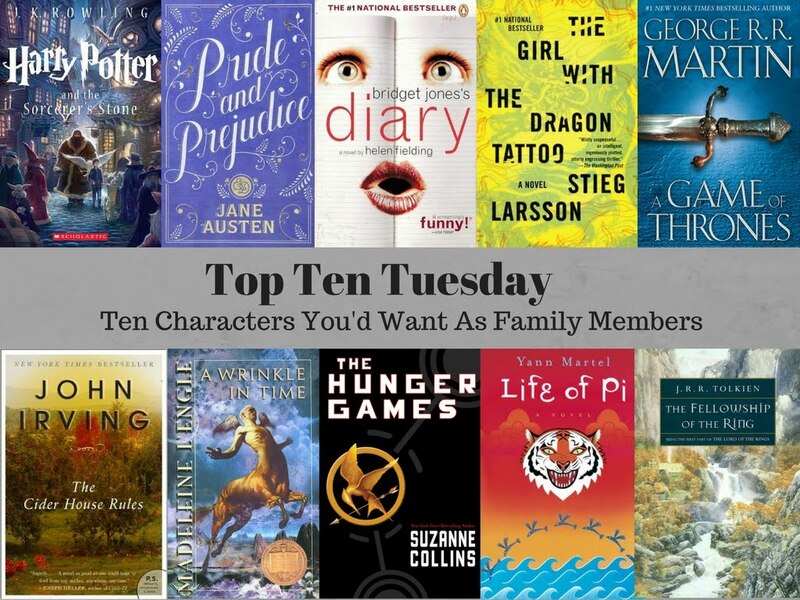 Top Ten Tuesday is a weekly linkup of book bloggers hosted by The Broke and The Bookish! This week's topic is a rewind...i.e go back in the archives and find a topic you didn't do the first time around and do it. 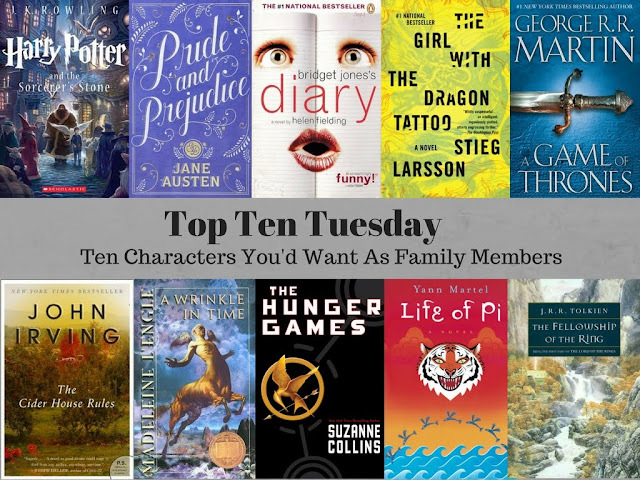 I picked a way old topic, long before I started book blogging: ten characters I'd want as family members! I love character-driven writing and usually remember more about them than the plot for most books, so this topic spoke to me. Fred and George Weasley (Harry Potter): I grew up with just one sibling, my sister (who I love and adore), but Fred and George seem like the perfect brothers. Constant pranking would thicken your skin but how could you stay mad when they're so delightful? I'm counting them as one because they're a matched pair. Elizabeth Bennett (Pride and Prejudice): Her bright wit and lively personality would make her a great sister. Can you imagine all the fun marathon phone calls you could have with a sister like Lizzy just snarking on everyone? Katniss Everdeen (The Hunger Games): On the flip side of the sister coin, Katniss is fiercely protective of her own and would make sure no one ever messed with you. Lisbeth Salander (The Girl With The Dragon Tattoo): She doesn't seem like she makes much of an effort to be super pleasant to a lot of people, so I don't know that I'd want her in the immediate family, but as a cousin that you see maybe once or twice a year? And feel like you could maybe call on for backup in case of emergency? Perfect! Pi Patel (Life of Pi): A dad who can tell a story like Pi Patel can tell a story would be an awesome dad indeed. Tom Bombadil (The Fellowship of the Ring): Too irresponsible for a parent, but a whacky uncle who shows up every so often to be charming and lighthearted and sing songs and tell stories? Yes please. Wilbur Larch (The Cider House Rules): Dr. Larch's fatherly love and empathy for orphaned Homer Wells is so touching, even when Homer spurns him and his work. I've already got a book dad, but how about a grandpa? Bridget Jones (Bridget Jones' Diary): I'm giving myself all kinds of fictional siblings, because it wouldn't be hard to be the good/together sister next to Bridget, and she's really very good natured and would have the BEST stories. Catlyn Stark (A Game of Thrones): She's flawed, like every single person in George R.R. Martin's world, but she's strong, loves her kids, and raised a bunch of fundamentally decent people. She reminds me of my actual mom, and I'd gladly join Sansa and Arya as one of her daughters! The whole Murray clan (A Wrinkle In Time): I want to be a part of this entire educated, loving, crazy-adventure having family. Just all of them. Wouldn't want to depend on him to be there to pick me up from swim practice after school, but to breeze in, perk everyone up, and then breeze out again he'd be tops! Thanks! Katniss and Bridget Jones all the way! Katniss and Bridget Jones in the same family would be...interesting for them, but the best for me! Gandalf would be an EXCELLENT granddad! I think I'd be a little scared of Katniss but at least if she was your sister you could guarantee she would fiercely protect you! In real life I'm a big sister, but if I were ever to pick a big sister for myself, Katniss is the best one I can imagine! Lisbeth is definitely a little volatile...wouldn't want her in the immediate family for sure!